A rich and compelling history of mountaineering ...At your fingertips. High Summits is the result of over 30 years of research into the fascinating world of international mountaineering. An essential guide to mountaineering history, this year-by-year account spans all seven continents and dates from 450 B.C. through 2011. In it you'll find everything from the monumental to the hard-to-find-trivia including: The most significant 370 Peak First Ascents as well as over 600 other types of first ascents on mountain faces and ridges; 345 detailed listings of major advancements in mountaineering gear, clothing, and climbing equipment; 171 references to the development of various climbing techniques on snow, rock, and ice; 58 hand-drawn maps and 57 carefully chosen photographs to accompany over 2,800 climbing events around the world; Appendices that include 17 unique mountain summit collections and the author's ten most significant events in mountaineering history. 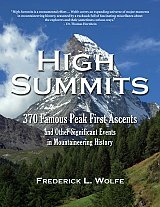 Taken from expedition accounts, biographies and autobiographies, climbing journals and diaries, mountaineering museums, magazines and newspapers, films, documentaries, newsletters, and interviews, High Summits is one of the most comprehensive studies of its kind. A must-have reference book for anyone interested in mountaineering, from the aficionado and weekend climber, to anyone who just likes to read about the majesty and allure of climbing the most significant peaks in the world.